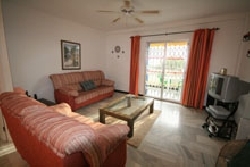 Situated in the heart of Calahonda,this apartment is on the 3rd Floor and is accessed by either lift or stairs. This 3 bed 2 Bath apartment has just undergone extensive refurbishments to the kitchen and both bathrooms! 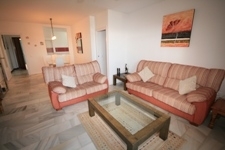 The lounge/diner is very spacious and has a patio door leading on to a sun terrace with sea views. It has Uk Tv. The master bedroom has a double bed with an en-suite shower room. There is 2 single beds in the 2nd and 3rd Bedroom. The kitchen is Ultra modern and very well equipped. It has a microwave, dish washer and a separate utility room with a Washing Machine and clothes line. There is air conditioning throughout the apartment. 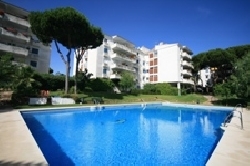 The secure complex boasts superb gardens, an enormous 25m main pool and a kiddies pool which is smaller and very shallow! It's about 30 minutes by car from Malaga airport. Taxis are readily available at the airport but transport to and from the apartment can be arranged. 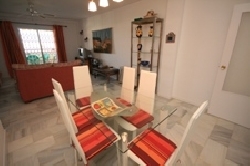 Calahonda is well served with all amenities i.e. 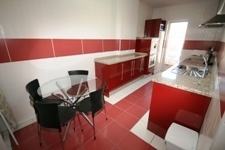 banks, supermarkets, medical centres, shops, restaurants and bars and they are all within a short walk of the apartment. So a car is not compulsory! The local stretch of coast from La Cala to Las Chapas boasts countless restaurants, bars and beaches. The Picturesque Marina at nearby Puerto Cabopino, with arguably the best beach on the coast is the perfect place to relax. The Spectacular Marina at Benalmedena and fashionable resorts of Marbella & Puerto Banus are just a short drive away. Nearby Fuengirola, is a busy and lively Spanish town with major stores and facilities on hand including train station and coach terminus for excursions. 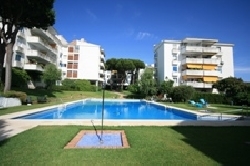 The area is well known for its variety of golf courses and all are within a short few minutes drive from the apartment. Green bookings are easily arranged via the clubhouses.